Game 3 will pose as great adversity for the Capitals and their Stanley Cup aspirations as they face the Pittsburgh Penguins in the hostile PPG Paints Arena. To have a chance, the Capitals will have to play their hearts out for sixty minutes and find a way to beat Marc-Andre Fleury who has performed exceptionally well so far in the series. The stars have shined for Pittsburgh in D.C and now have a chance to ignite their hometown fans into a frenzied celebration with every goal they register. The Steel City is one of America’s most passionate sports markets full of rabid passionate fans that demand excellence from all three of their professional sports teams. While the Steelers are the city’s most beloved franchise, the Penguins are not far behind despite facing bankruptcy twice in their history. Mario Lemeuix would save the team as a player and then again as a businessman by purchasing the team. In 2005, prized prospect Sidney Crosby was drafted by the Penguins and cemented a new successful era for the Steel City’s hockey club. Since then the Penguins have won two Stanley Cups and the Washington Capitals have faced them twice in the playoffs in both of their Cup years. Caps fans everywhere hope that this history will prove irrelevant tonight in Game 3 as their Capitals face a 2-0 series hole. As hard as it is to say, the Penguins had simply out-skilled the Capitals in the first two games. 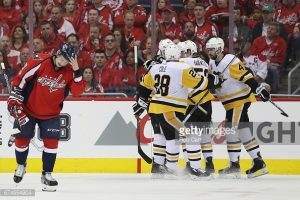 Speed, great goaltending, and precise passing plays overwhelmed the Capitals at home and the Caps must find away to slow down the Penguins high-octane offense. It begins with Braden Holtby. Holtby self-admittedly did not play well in Game 2. The third goal given up was uncharacteristic of Holtby as he remained too deep in his crease and gave up too much net for Jake Guenztel. The poise we saw in Braden Holtby throughout the whole regular season was absent in Game 2 and he would eventually be replaced by Philip Grubauer. Holtby will play tonight and he must perform better for the Capitals to have a chance to get back in this series. All of the blame can’t be placed on Braden Holtby alone. Kevin Shattenkirk has got to be better and play like the player we bought a lot for before the trade deadline. Broken coverage and a costly penalty cannot be repeated if the Capitals are going to take Game 3. The lack of scoring in the bottom six is unacceptable at this crucial part of the season as Daniel Winnik and Jay Beagle must dent the twine to ease the pressure on the top six. It is not time to despair for the Capitals just yet. The series is still winnable and a victory tonight can shift the momentum of the series for the better. If they do lose however, the Capitals chances of winning their first Stanley Cup will prove dismal and bleak.